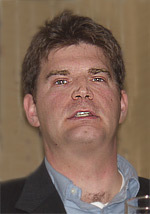 Rich Patterson, Marketing & Sales Manager for ROOTS athletic wear spoke at a BCAMA (American Marketing Association B.C. Chapter) breakfast seminar at the Hyatt on Burrard January 20th, 2005. His presentation was entitled "ROOTS - How to Play the Game" ... but maybe it should have been called "ROOTS -- We Don't Share Secrets & We're Not About to Tell Our Competitors How to Play the Game." Right off the top Patterson reneged and said he wouldn't share game secrets with us because ROOTS was currently tendering an RFP to VANOC regarding Turin, Italy for 2006. What he should have also mentioned was that companies are not at liberty, even if they wanted to, to share information describing what it really takes to "Play the Game" because it would breach confidentiality agreements with Olympic organizations. Patterson is a good speaker with a humorous style, and his message about not sharing anything of consequence got a giggle from the audience, but I'm sure quite a few were disappointed with his disclaimer. Personally, I uttered a silent, "Damn -- snookered again." It's sad to say, but it is rare to attend an "Olympic-themed" seminar and learn anything of logistical or competitive consequence, and this was no exception. In the back of my mind I was hoping Patterson would stretch a little beyond the usual fluff and give the paying audience a good reason to show up at 7:00 am. Unfortunately, his presentation amounted to little more than a ROOTS commercial. I like ROOTS products, but not that much, and now maybe even less. OK, I'm lying, I still love the white ROOTS Olympic track suit from last summer. Patterson was bursting with humor. He then joked he wasn't going to subject us to the self grandiose Olympic Spirit fluff-fest video clip that has kicked off every 2010 presentation in the city over the last three years. There was a pregnant pause when the audience hesitated to laugh for fear of offending the Olympic Gods. It turned out he brought one of his "own" videos that featured ROOTS and "their" Olympic success stories. Damn, snookered again. A presentation that is entitled "How to Play the Game" should include at least a little inside information from the granddaddy of Olympic sports clothing outfitters. They've had a good kick at the can and it would be nice to hear what it's really like to deal with Olympic organizations. It's not all sugar and spice, and to his credit Patterson never said it was, but to the uninitiated who have no idea what it is like to negotiate and manage an Olympic relationship it wasn't even close to the real deal. If you think I'm a little harsh, maybe I am, but for very good reason. Patterson's presentation was hosted by the B.C. Chapter of the American Marketing Association. He must of thought he was addressing a Vancouver Board of Trade breakfast attended by sleepy hooky-playing suits who only show up because their fat companies pay for the tickets and it gets them out of the office for a few hours. The BCAMA crowd is actually a vital group of active marketing professionals who run their own small and midsize businesses and have no time to waste. They deserve better. In defense of ROOTS, Patterson did share some interesting information, but it wasn't anything groundbreaking or beyond Marketing 101.
and a few more generic tidbits. No one can blame ROOTS for not wanting to expose more because they want to continue their relationship with Olympic organizations, but in the future it would be nice if they titled their presentations more accurately. The title was a shameless HOOK to sell tickets. Any presentation including the words "Olympic, 2010, Spirit of the Games, etc." attracts attention and sells tickets. Canada respects ROOTS. We'd come to hear Patterson speak even if he entitled it "WOW, What a Ride!" -- maybe not at 7:00 am and for forty-five bucks, but noon and twenty-five would be reasonable. Even though I never expected to hear anything that would undermine ROOTS' competitive advantage, it would have been nice to hear about some of the real challenges of dealing with Olympic organizations. I have news for you Rich ... not having enough stock on hand for Olympic crowds in a feeding frenzy isn't, as you described, a challenge -- it's bad planning. Tell us something we don't know. Now for a dose of reality ... I truly appreciate that it's hard for most people to fathom what I'm about to say, partly because they want to think of the Olympics the same way they did when they were a kid, and also because most companies erroneously believe they will win contracts with Olympic organizations down the road (sold out seminars all over the city are a testament), but it's no secret to the informed *that Olympic organizations drive the hardest deals in the world; and that they are often grossly mismanaged; and that they sometimes leave contractors on the hook for years; and that they don't pay their bills on time; and that they leave countries in dire financial straits; and that their senior executives have been charged with accepting bribes and fraud; and that they are riddled with doping scandals; and that they don't police themselves ethically; and that they bully small local businesses; and that they contract sweatshop workers; and that they wreak havoc on the environment; etc. The list is even longer and it's possible ROOTS never experienced any of these challenges, but knowing owners Don Green and Michael Budman's reputation for negotiating tough business deals it's not beyond the realm of possibility. Olympic organizations are pushy. The ROOTS boys are from Ontario and they don't get pushed around without pushing back. When an ethical organization is associated with an organization rife with unethical and illegal transgressions it is a challenge to deal with them. Normally ROOTS would have no incentive to broach any of these areas, but if they advertise that they're going tell us "How to Play the Game" they are obligated to at least hint that it is no walk in the park. Olympic organizations are BIG business machines that count their success in the billions. It isn't a mom and pop set up. This is a Wal*Mart / we control the market type of business model folks. The Olympics promote a very strong culture and in many ways it is much like a cult. You play by their rules. You are either with them, or against them. There is no middle ground and they make no bones about it. Patterson shared with us that in order to get a foot in the door they did a little pro bono work for the Barbados team in 2004. He made it sound like they were doing it out of the goodness of their hearts, but the reality is that if you want Olympic business you often have no choice but to give your products or services away -- at least in the beginning. If you were in the audience and really paying attention this was the best strategical information he shared that morning -- Olympic relationships are the most valued when you use them to promote your products in parallel markets. 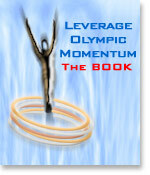 Leveraging Olympic momentum is very important. He didn't say it outright, but the message was there if you read between the lines. 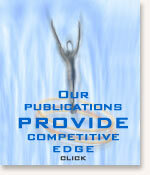 Olympic related sales only represent about 25% of ROOTS revenues during Olympic years. Keep in mind too that they are a private company, so no one but the owners know all the numbers. Sponsors, suppliers and contractors very rarely profit directly from Olympic relationships. It is usually the back end that makes it all worthwhile. Sponsors, contractors and suppliers pay for the right to associate so they can leverage it down the road through better employee relations and brand visibility. It can cost a sponsor upwards of $60 million to sit at the table. The local paper the day after the ROOTS breakfast commercial, err I mean presentation, announced that Chip Wilson of lululemon threw his yoga mat in the ring and submitted a proposal in competition with ROOTS to suit up the athletes in Turin Italy next year. A few months ago I mentioned in one of my articles that it would be great to have a company like lululemon involved. The challenge however is that lululemon and the Olympics are so far apart philosophically that it might take a miracle to forge a union. I can understand from a marketing perspective why lululemon would want to leverage Olympic momentum. And without doubt it would be very good for the Olympics to be associated with an organization as moral as lululemon, but eventually lululemon will be put in a compromising position where they will be forced to choose between their meditative, holistic, pro-peace brand and the very aggressive take-no-prisoners Olympic business-style described above. At this crossroad, if lululemon bows to Olympic pressure their yoga congregation could lose faith, roll up their mats and trek to Kathmandu. lululemon would have to move laterally and focus more strongly on a sporting / competitive image to make up for the loss in the yoga camp -- and maybe they are prepared to do so because it would raise their visibility overnight and eventually become incredibly lucrative. Orrr, ... envision that lululemon wins the Olympic tender -- and this is where you have to suspend belief a bit, pretend they win the tender, but only on the condition that they do it their way. What is "their way" you ask? "Coke, Pepsi and all other pops will be known as the cigarettes of the future. Colas are NOT a substitute for water. Colas are just another cheap drug made to look great by advertising." Coca Cola is a long running Olympic sponsor and I can't imagine they are going to feel too good about this statement. "Communication is complicated. Remember that each person is raised in a different family with slightly different definitions of every word. An agreement is an agreement only if each party knows the conditions for satisfaction and a time is set for satisfaction to occur." It's a great manifesto. I have nothing against ROOTS, but I'd love to see lululemon win the Olympic tender. Not only would we have the best looking athletes of all time, but like Sinatra, if lululemon did it their way the Olympics might actually move back to being regarded as a peace-promoting organization. lululemon might actually change the shameless way the Olympics pit country against country. Most people don't realize it, but when the Olympics was first created the idea was to have athletes compete independently against each other. It was designed to promote peace and downplay aggressive country-against-country competition. Over the years it has turned into a global war for medals. I'm all for winning and change, but individual athletes are no longer acknowledged in the manner the Games were originally conceived, instead countries spend billions of dollars ensuring their collective medal count is the highest. Instead of bringing humanity together it has actually divided us. My country is better than your country. The IOC, VANOC and sponsors are shamelessly responsible for creating this divisive environment. Sponsors are myopic in their focus to reward only the #1 Athlete. A few years ago NIKE put a fine point on it when they created the slogan, "You don't win silver. You lose gold." Very harsh, but in the corporate battlefield, also true. Maybe lululemon will instill in us that GOLD isn't all that cool and neither is Silver or Bronze. What is cool is doing your personal best and competing for the sake of competition and not the multimillion dollar payout from Coca Cola. re-taught the world to sing in perfect harmony. One last point ... it wasn't a coincidence that ROOTS showed up in Vancouver to do a seminar on the same day RFPs were due. This is possibly the best lesson to be learned from the Ontario-based company. If you want to "Play the Game" you have to recognize the importance of promotion, and leverage Olympic momentum to it's full potential. It was very smart of ROOTS to steal thunder from lululemon's announcement that they too were submitting a proposal. On lululemon's home turf no less. Damn, snookered again.